If you like to entertain outdoors and show off your cooking prowess, then the Kamado Joe Big Joe 24-inch Grill is for you! The Big Joe gives you plenty of grilling surface for cooking those burgers and brats for your guests or rib-eyes for those special occassions. And Big Joe is easy to maneuver, thanks to the locking caster-style wheels. Thanks to the ceramic vessel, which makes a great insulator, less heat can escape resulting in less required heat for cooking. And with less heat escaping, you can cook at significantly higher temperatures or at very low temperatures for a significantly longer time. Ever want to smoke a rack of ribs, brisket or my favorite, whole chicken? Then you'll want to cook at a low temperature for a long period of time. 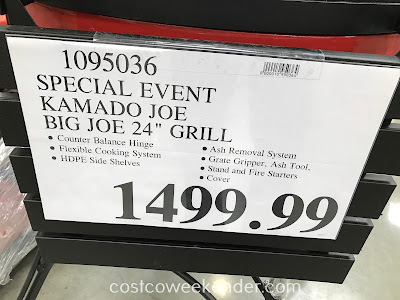 With the Kamado Joe Big Joe 24-inch Grill, it will be easier to maintain a constant temperature. And you won't have to provide more fuel to the fire as often. You'll be an expert barbecuer in no time! And since the Kamado Joe Big Joe 24-inch Grill is a special event item at Costco, it will only be available for a limited time. So get it while it lasts! It's definitely a good alternative to a Big Green Egg which tends to be more expensive.